VOCAL’s speech coders have been extensively optimized using proprietary techniques for leading DSPs and conventional processors from AMD, Intel, TI, ADI and other vendors. Benchmarks have shown that VOCAL’s highly optimized C with limited assembly code compares well against other vendors implementations which typically require significantly more assembly language. Typically the difference in performance is within a couple of MIPS. However, the portability and maintainability of our code benefits our customers by lowering the initial costs, easing integration, reduced maintenance costs (fewer coder changes when upgrading compilers), and greater availability of optimized code for different modern processors. Contact us to discuss your application requirements. In addition to ITU and ETSI vocoders, other speech coders have been developed to meet specific objectives. The two main groups of developers are government organizations and private industry. In some cases, the speech compression techniques developed have advanced the technology by their applications in challenging environments. In other cases, the speech coders have democratized access via common, well-understood methods that can be widely and freely adopted by many applications. Government/military organizations have developed a series of speech coders to meet the objectives of utility, lower bandwidth, higher delay and noisy environments. This also includes the early fundamental work on speech coding using LPC and CELP techniques funded by the US government. Later developments have resulted in inter-governmental standards for universal, interoperable voice compression algorithms complete with noise preprocessing to accommodate acoustically hostile environments. MELP/MELPe is the result of this multi-year, multi-country, multi-developer effort to achieve a decent quality low-bit rate speech coder. One group in private industry realized that for many of their applications, network bandwidth is relatively cheap and availability of better voice quality is a salient feature. Hence, internet wideband audio codecs such as Opus, Speex and SILK have become very popular. Conference calls are no longer an exchange of “can you say that again” since you will not only hear a pin drop, but be able to distinguish an Asian speaker from a Korean speaker. iLBC is another popular speech coder for new VoIP deployments. It was successfully used in Skype, before the adoption of SILK, and other low-cost or free VoIP communications systems including computer games. Another group of private industry simply attempts to make their own work standards in their field. In some extreme cases, it is practically unimaginable how an un-documented proprietary vocoder can end up in specifications and requirements for domestic and international communication systems for first responders. The P.25 radio system use the proprietary DVSI voice codecs which are for all practical purposes sole-sourced. VOCAL has developed a demonstration hand-held radio system for first responders with a complete soft radio using a single DSP as its only processor and suitable RF electronics. 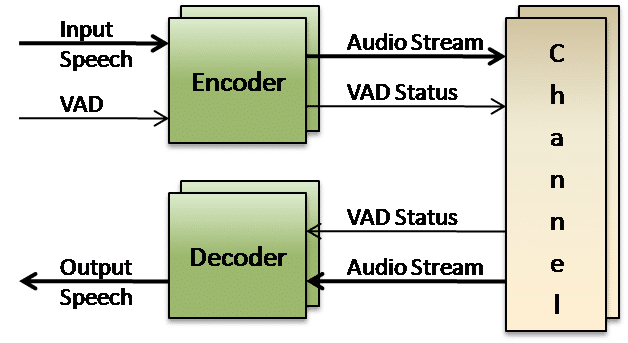 The DSP implements the radio channel modulation/demodulation, speech codec, battlefield noise cancellation, vox and internal web server (for configuration).